Elopement Story with a Twist, 1892. Romance for the Victorians could be a dramatic and dangerous affair according to sensational newspaper reports of the time. Life hadn’t been kind to Jack McKenna. His wife ran off with his best friend and left for America. His daughter was dying of influenza. He, too, was struck down with the flu. Only a few shillings stood between him and starvation. In January 1892, a well-dressed woman breezed up to the workhouse in Deptford, London and asked for Jack by name. When shown to his room, the Leeds Mercury reported, she fell to her knees and begged his forgiveness. It was his estranged wife, back from California, where his ex-best friend had made a fortune in the gold-fields. The ex best friend was now dead, and his wife wanted to pick up where they’d left off. 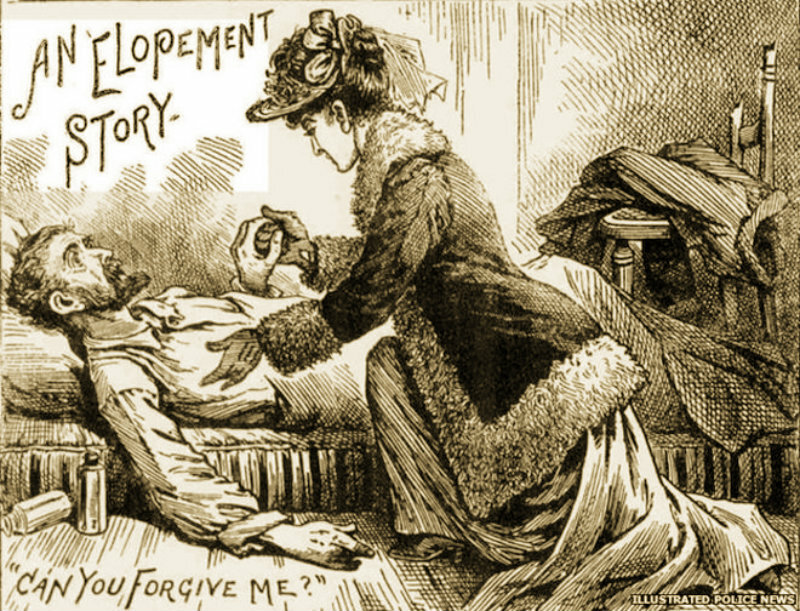 But in a plot twist worthy of Thomas Hardy, she, herself, caught influenza while nursing her husband back to health. This entry was posted in HISTORY AND PEOPLE and tagged bizarre, united kingdom. Bookmark the permalink.